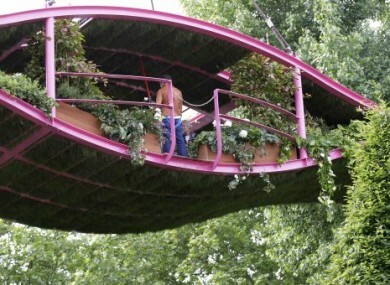 Diarmuid Gavin's award-winning suspended garden at this year's Chelsea Flower Show. DIARMUID GAVIN’S award-winning Irish Sky Garden is apparently causing controversy back in Cork, where the city council is reportedly unhappy with the garden’s €2.5m cost. Cork City Council and Fáilte Ireland sponsored the construction of the garden, which won coveted gold at this year’s prestigious Chelsea Flower Show. The eye-shaped garden is suspended 82 feet in the air by a crane and features pools, plants and grasses. Philip Ryan reports in the Irish Mail on Sunday that the council oversaw the project’s €2.3m budget but is unsatisfied with the gardener’s breakdown of the high costs involved, which initially included €750,000 to buy a crane. This figure was later revised to over €513,000 for crane hire and the final cost rose over €2.5m. It also reports that Gavin says the council refused to meet him or speak to him and he went to former PD minister Liz O’Donnell, who then approached Minister Simon Coveney, before Minister Leo Varadkar also got involved. Ryan says the council provided €406,000. Welcoming news of Gavin’s success in Chelsea, Fáilte Ireland said it believed the garden, which is being relocated to Cork, would “significantly boost Cork tourism” in terms of visitor numbers and revenue for this year. The tourist group said that the garden would give Cork city an icon along the lines of the London Eye or the Eiffel tower. Email “Diarmuid Gavin's flower show entry cost Irish taxpayer €2.5m - report ”. Feedback on “Diarmuid Gavin's flower show entry cost Irish taxpayer €2.5m - report ”.